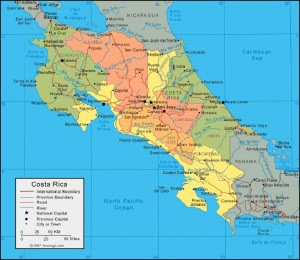 Costa Rica Castle: "This time you, next time me"
says the second Tico to stop and help me. My rear bearing on the motorcycle blew up from being lubricated with more water than grease on my way to Samara at 1:30 in the afternoon on this beautiful sunny Friday. I wasn't there five minutes and the first Tico on a motorcycle stopped and asked if I needed help. Next thing I know he's pulled out a wrench and sees that I'm having a hell of a time getting the main bolt out because it's rusted in the bearings. We're hammering, turning and torqueing, but only making small gains. I start to realize my day going a different way. The second Tico pulls up and almost simultaneously a large truck with a wooden bed behind him. Now it's a full committee in Spanish discussing my better option to get to La Bomba in this guy's truck. We lift my bike and move it as close to the front as possible. We tie down each tire, but there's plenty of play so I sit on the bike for the ride. And what a ride it was! Like riding a bull with my right hand clenched on the backboard and my feet steadying the swaying bike through the potholed highway. At La Bomba I see a familiar face and know that leaving someone without help just isn't what this town is about. Hours later I’m home again, but never lost my gratitude to all those in the world that stop and help. Next time me.